The battle over fossil fuels in California signals the start of a clean energy era. 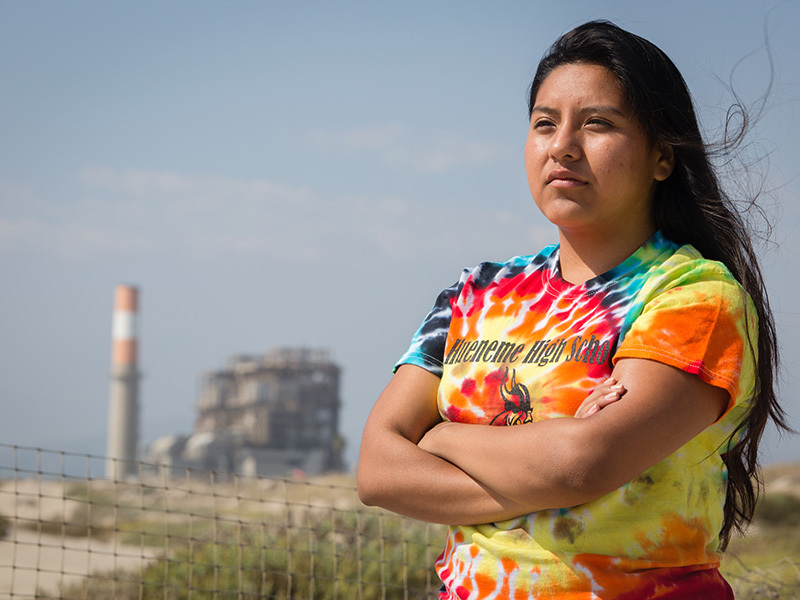 Lilian Bello spoke against a proposed natural gas plant in Oxnard, California, that, if allowed, would join three existing gas plants on the city's beach. Update: NRG’s proposal for the Puente gas plant in Oxnard, California, is officially dead after the company withdrew its application for the proposed plant in December 2018. The days following President Trump’s election in 2016 were a turning point for many. Lilian Bello was no exception. At that time, Bello was a student at Hueneme High in Oxnard, Calif., a diverse community along the iconic Central Coast that’s also known as one of the strawberry capitals of the world. While teachers soothed frantic students, many of whom came from immigrant families, a representative from a local social justice organization showed up with a different objective: to rally them around fighting for their environmental and human rights. Bello soon learned that the city’s three gas power plants were contributing to its dismal asthma rates — and a powerful energy company was dead set on building a fourth. Bello, who has suffered from asthma as long as she can remember, joined others in opposing the plant. In March, after a four-year-long fight, California’s grid operator approved a clean energy alternative to the shortsighted plan, pushing it off a cliff. Oxnard residents fight for clean air. The victory was sweet for the community, where predominantly low-income, immigrant residents have long lived under a haze of industrial pollution — while watching their more affluent neighbors like Santa Barbara and Malibu enjoy clean air and clear skies. And it signaled something sweeter, inspiring other Southern California communities to insist on clean energy, and putting investors and regulators nationwide on notice that new natural gas plants have become difficult to justify. 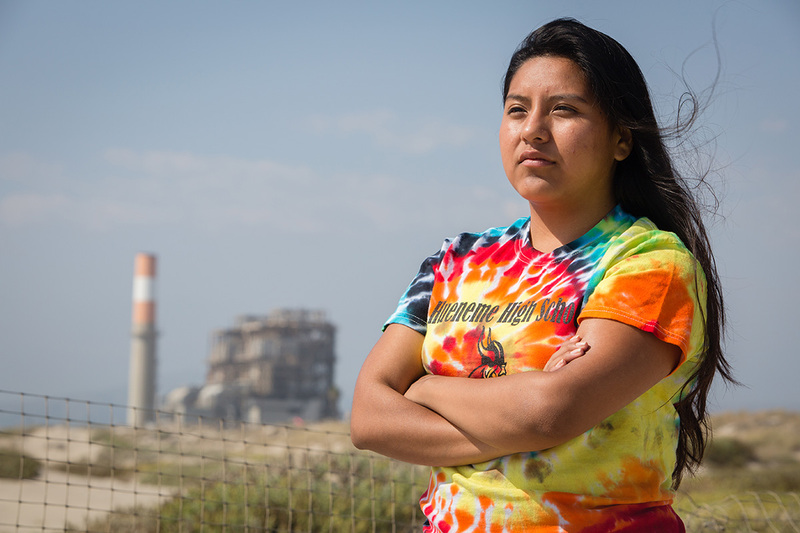 Oxnard residents protest NRG Energy’s proposed Puente power plant. The 262-megawatt gas-fired plant would have increased pollution in the already-overburdened community. The fight to shut down a gas plant project in Oxnard began in the summer of 2014 after NRG Energy proposed building a plant called Puente to provide backup power during peak times of energy use. The project seemed inevitable. California regulators had identified a need for local energy generation and had historically met those needs with new gas plants. But many Oxnard residents were tired of seeing the city littered with these hulking metal structures, complete with tall smokestacks that belch toxic air and gaping ponds filled with wastewater. In addition to the three existing power plants marring the city’s coastline, Oxnard is home to a Superfund site full of toxic slag from a metals recycling facility. It also bears the brunt of the toxic pesticide overload that comes with being an agricultural powerhouse. 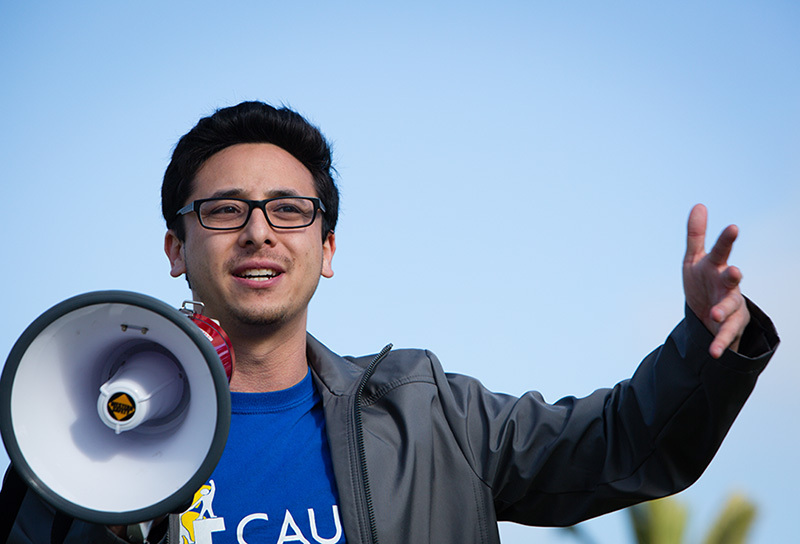 “In a community like Oxnard, you can go up and down the coast, and you’re very aware of the differences in your community versus what you see in other communities,” says Lucas Zucker of the Central Coast Alliance United for a Sustainable Economy (CAUSE), the group that visited Bello’s classroom. Lucas Zucker, Policy and Communications Director at Central Coast Alliance United for A Sustainable Economy. Bello, whose asthma used to be so severe and frequent that she once used a special breathing device, began attending city council meetings to help put a face on the issue. She was joined by a growing chorus of Oxnard youth that showed up at hearing after hearing with powerful and inspiring testimony. Many came from farmworker families who had seen their parents tolerate multiple injustices, and they wanted to step up and advocate on behalf of their loved ones. The students found creative new ways to express their opposition to the project, including a rap that played off the lyrics to “The Fresh Prince of Bel-Air” theme song. The pushback worked, at least temporarily. The Oxnard city council sided with the community — twice, actually — unanimously prohibiting any new coastal power plants of 50 megawatts or greater. The council’s resolve to fight the plant, even as NRG alternately used charm and threats to try and force the proposal through, was a reflection of the town’s sustained efforts over the last few decades to pressure its representatives to protect the community from additional environmental harms. As the Puente fight continued to play out, other communities across California battling their own fossil fuel projects were watching closely to see whether the state’s frequent platitudes about being a clean energy leader would finally come home to their beleaguered towns — where these policies are needed most. 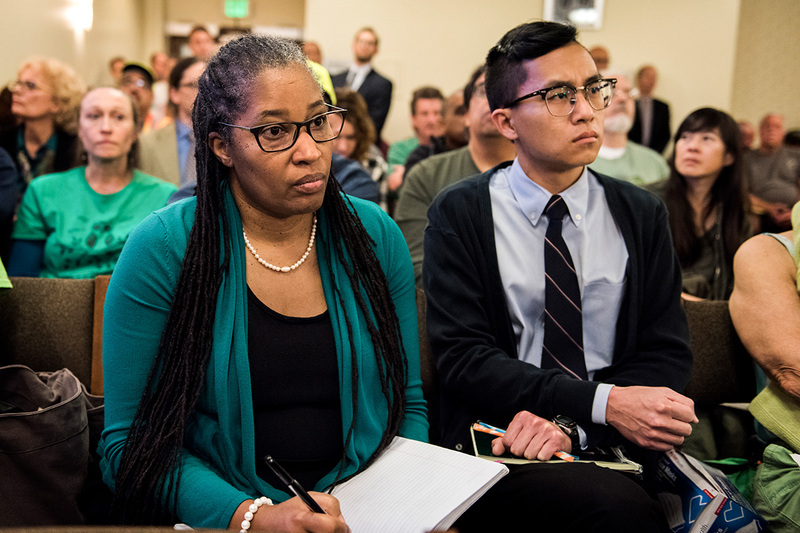 Earthjustice attorneys Angela Johnson Meszaros and Byron Chan at one of several hearings held on the proposed Grayson gas plant in Glendale, Calif. These packed hearings often went on into the late hours of the night. Glendale, Calif., about an hour’s drive east of Oxnard and part of Los Angeles County, is one of those communities. Like Oxnard, the city was facing a proposal to build a large new gas plant that would lock the city into dirty energy for decades. Many people opposed the plant, including economics professor Dan Brotman, who argued that falling energy storage and renewable energy prices meant that cleaner options made financial sense for Glendale. State politicians are also currently pushing to pass legislation that will mandate 100 percent clean energy by 2045. If passed, it would mean any fossil fuel infrastructure that Glendale builds could be shut down in 25 years, leaving ratepayers with a useless, fossilized behemoth that cost $500 million to build. Another community keeping close watch on Puente’s fate was Santa Paula, a fertile orchard-filled town about 20 minutes from Oxnard. There, residents were opposing a gas plant proposal over concerns of cultural impacts, air pollution and habitat destruction. 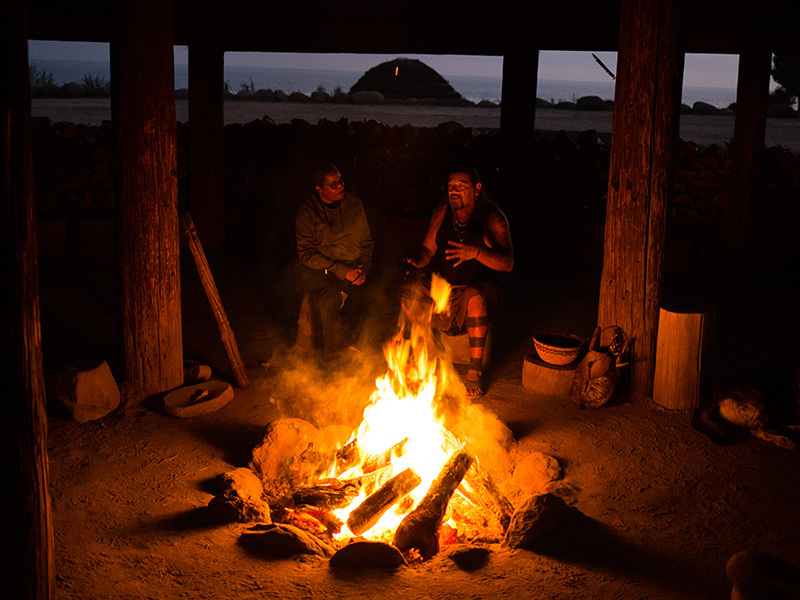 A Native-led nonprofit called the Wishtoyo Foundation also opposed the plant, set to be located on the Santa Clara River, because it would disturb the Chumash people’s sacred sites and natural places of cultural significance. 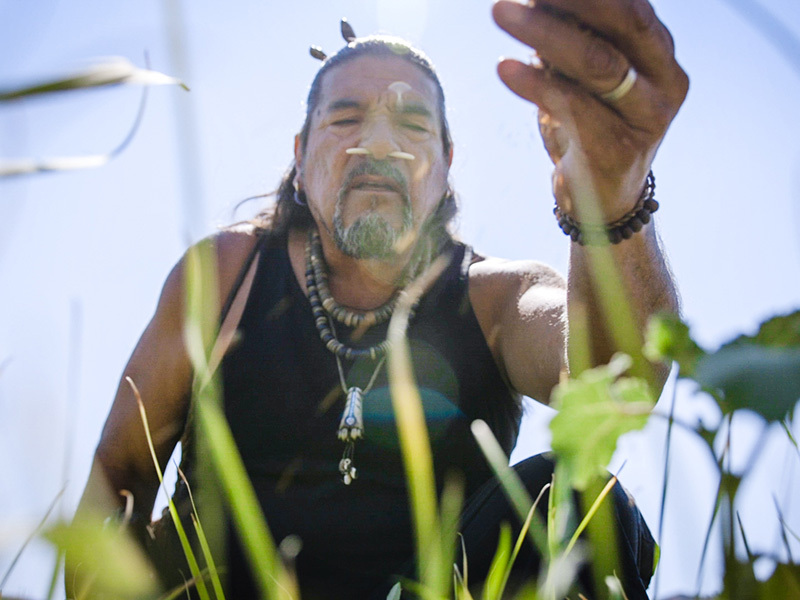 Mati Waiya, a Chumash ceremonial elder, founder and executive director of the Wishtoyo Foundation offers tobacco at the end of a ceremony held in opposition of the proposed Mission rock power plant. 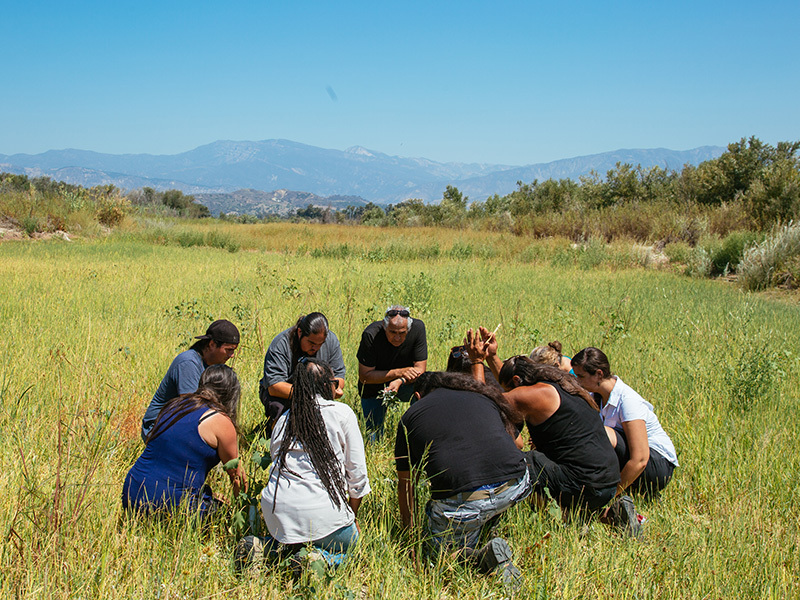 Members of the indigenous led non-profit the Wishtoyo Foundation gathered with Earthjustice and other local indigenous community members in Santa Paula, Calif., in opposition to a proposed power plant. 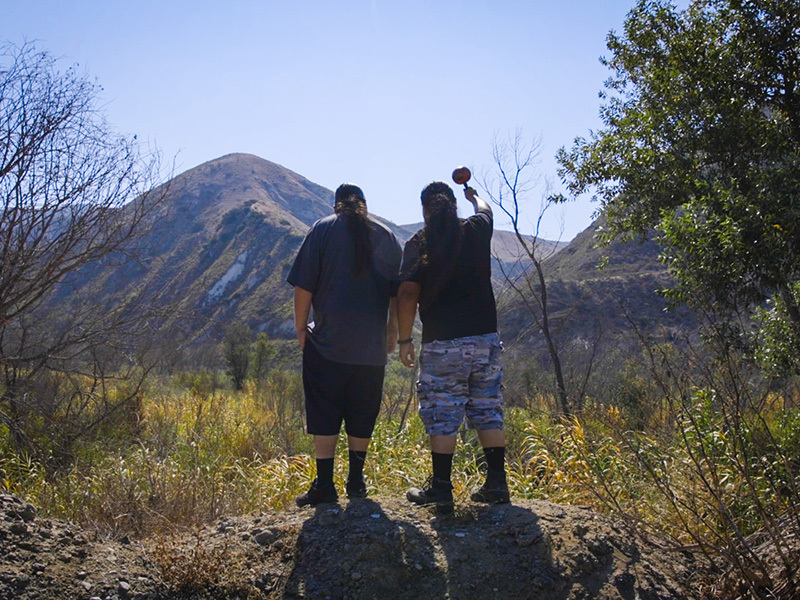 Sergio Valenzuela and Kote-Yakez Melendez, members of the Wishtoyo Foundation, look out over the Santa Clara River, or Utom, where a gas plant is proposed. Earthjustice attorney Angela Johnson Mezaros (left), speaks with Wishtoyo Foundation founder and executive director Mati Waiya. Earthjustice is providing critical legal support for each of these fights, as well as a communications and policymaking strategy to link the battles to the larger Right To Zero movement to get California to zero emissions by 2045. Zero emissions means no pollutants that dirty our air or disrupt our climate. 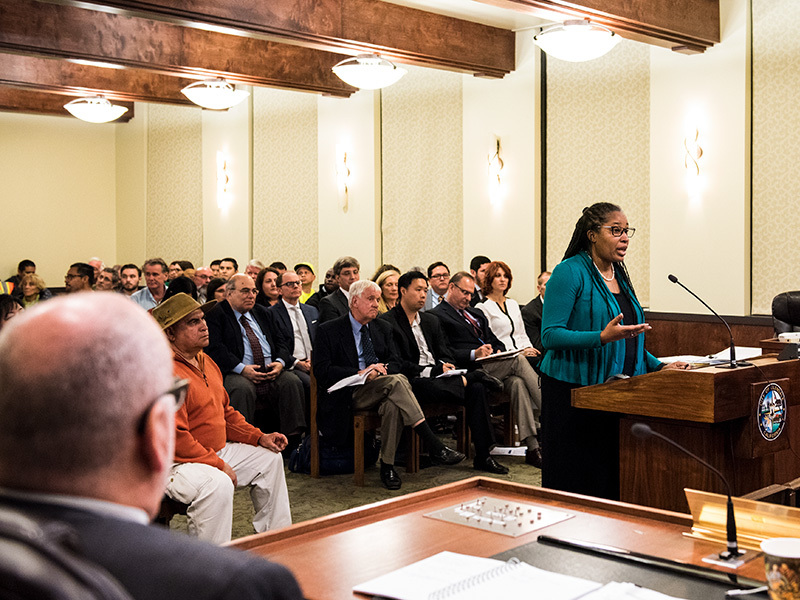 No two power plant proposals are alike, but collectively “they all represent a massive investment in fossil fuel infrastructure,” says Earthjustice attorney Angela Johnson Meszaros, who led the legal strategy in support of Santa Paula and Glendale community groups fighting new gas plants. Earthjustice staff attorney Angela Johnson Meszaros testifies about the health impacts of the Grayson gas plant. That question couldn’t come at a better time for these communities, who for years have watched California charge ahead on a clean energy revolution while proposing to leave them in the polluted dust. Though California leads both nationally and globally on pushing progressive environmental policies and technologies, it continues to rely heavily on natural gas. These gas plants have to go somewhere, and they often end up in communities of color and low-income communities, where they contribute to poor air quality that leads to asthma. Currently eight out of 10 of America’s most-polluted cities are in California, with Southern California counties like Los Angeles, San Bernardino and Ventura ranking highest in the number of unhealthy days for ozone. Back in Oxnard, as NRG slowly realized that the city was adamantly against the Puente project, the company dug in to wage a legal battle. While community groups argued that building the plant would create an environmental injustice for an already overburdened community of color, Earthjustice attorney Matt Vespa, on behalf of the Sierra Club, added that siting the plant on the beach put it directly in the path of inundation by sea level rise. 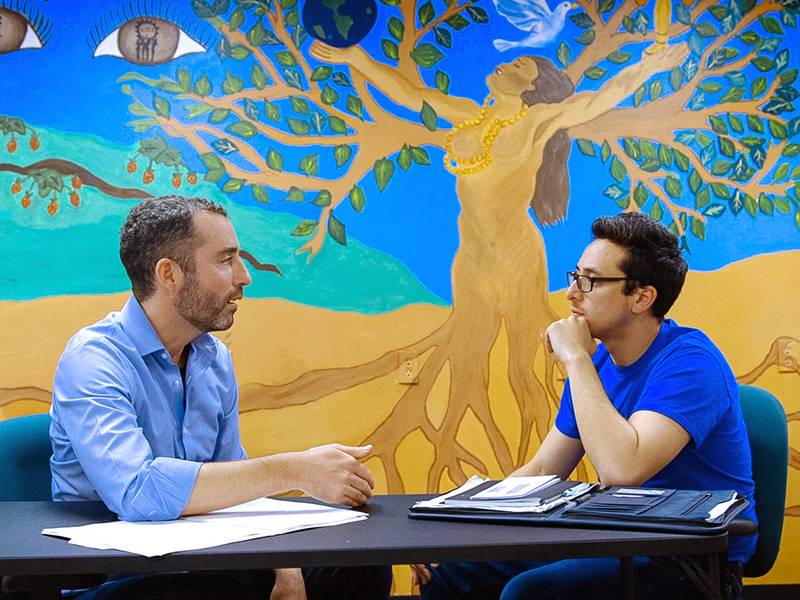 Earthjustice attorney Matt Vespa (left) speaks with CAUSE policy and communications director Lucas Zucker, who helped organize high school students against the power plant proposal. Around the same time as the Puente decision in June, the energy corporation proposing a gas plant in Santa Paula saw the writing on the wall and requested to suspend its proposed gas plant. 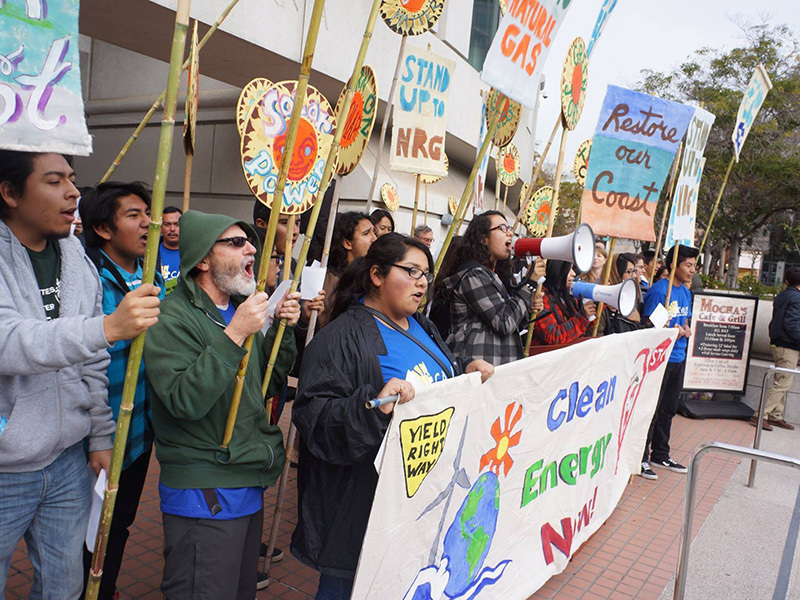 And, most recently, after months of packed hearings with hundreds of concerned residents, in April 2018 Glendale city council members hit the brakes on the $500 million proposed gas plant in favor of studying a clean energy alternative. Advocates celebrate a milestone toward defeating the Puente gas plant proposal. 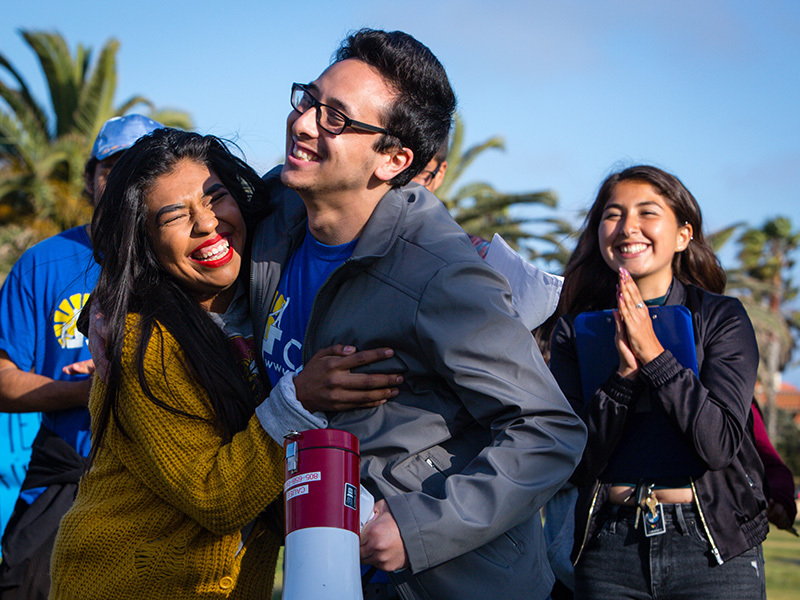 CAUSE policy and communications director director Lucas Zucker (right) hugs a fellow advocate at a celebration marking the end of the Puente Power plant. 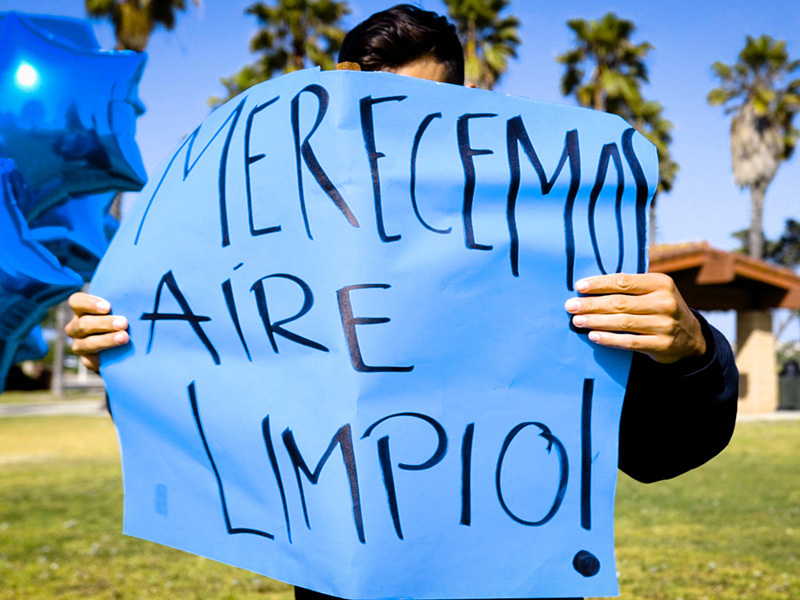 “We Deserve Clean Air” signs are set up at a celebration marking the end of the Puente Power plant. 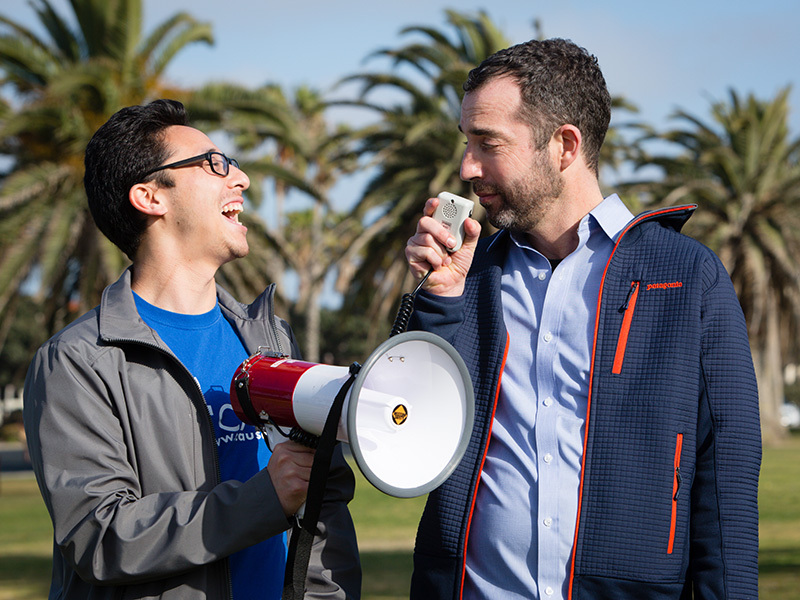 CAUSE policy and communications director Lucas Zucker Earthjustice attorney Matt Vespa celebrate the end of the Puente Power Plant. Leaders across the state believe that the progress in Oxnard is just the beginning. Since the Oxnard win, existing gas-fired plants have proposed to shut down decades before their expected retirement. And in January, the California Public Utilities Commission pressed Pacific Gas & Electric to replace three gas-fired plants with energy storage, paving the way for the retirement of the large Metcalf Energy Center in San Jose, and the Feather River Energy and Yuba City Energy Centers in Yuba City. California’s tech companies, meanwhile, are eagerly taking on the challenge of replacing fossil fuels with modern, clean energy sources. These local community fights are propelling a major change in energy markets as cities and towns transition off gas and onto clean energy. This year, finance experts have warned against investing in natural gas companies as clean energy tech has become cost competitive. Vistra Energy Corporation and Dominion Energy, which serve over 5 million customers in more than a dozen states, announced that they’re done building gas plants. Instead, they’re switching to solar. In addition, community uprisings in New Orleans and Colorado are taking hold as people band together to fight new fossil fuel project proposals. In a clean energy future, people are coming together around the idea that no place should be a sacrifice zone. 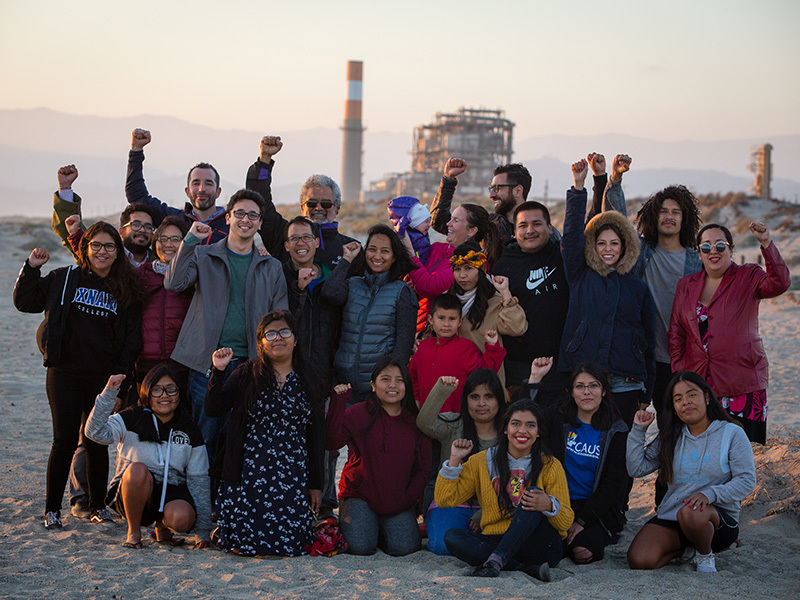 Advocates use the “Unity clap” to celebrate the defeat of the Puente gas plant proposal. A version of this story was originally published in the Earthjustice Quarterly Magazine, Summer 2018 issue. Be the first to read stories like this one and support our work toward a zero-emission future, with a tax-deductible investment in Earthjustice. Jessica A. Knoblauch is a senior staff writer. She writes for Earthjustice’s print and digital publications. Earthjustice’s California Regional Office protects communities and public lands from oil development, safeguards ocean ecosystems, advances clean energy innovations, clears the air in Los Angeles and the Central Valley, opposes hazardous fossil fuel transport, and fights dangerous pesticide use. It also houses Earthjustice’s Right to Zero campaign. Did you find this story useful?